Fiver bats at a mouse that's part of Doc & Phoebe's Indoor Hunting Cat Feeder. If you’ve ever seen a cat catch a bird in flight, you know that cats are expert hunters. 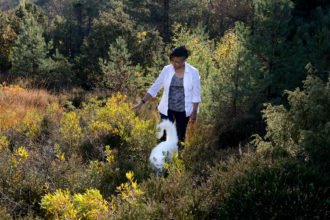 But when domestic cats live in our homes and get plenty of food at regular intervals, they aren’t necessarily getting a chance to exercise those skills. Cats who sleep too much, are overweight or have unwanted behaviors may simply be bored — a symptom some vets say can be easily remedy by introducing puzzles to their feeding routine. 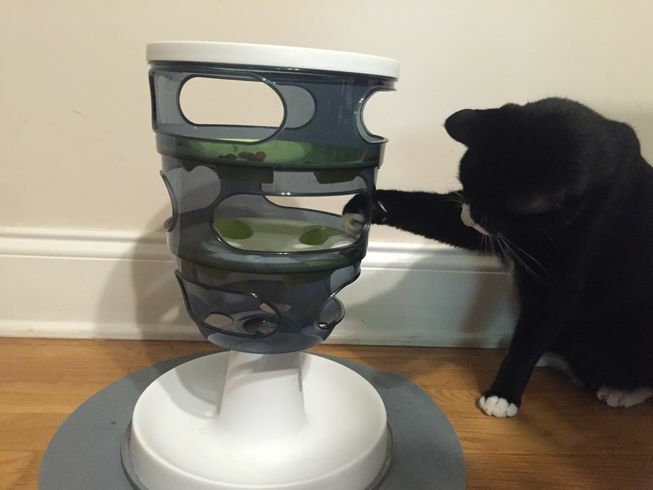 In 2016, The Journal of Feline Medicine and Surgery published a paper addressing the benefits of puzzle feeders for improving the lives of indoor cats. This study found that cats who were given opportunities to work or hunt for their food often lost weight or ceased undesirable behaviors such as aggression and anxiety. 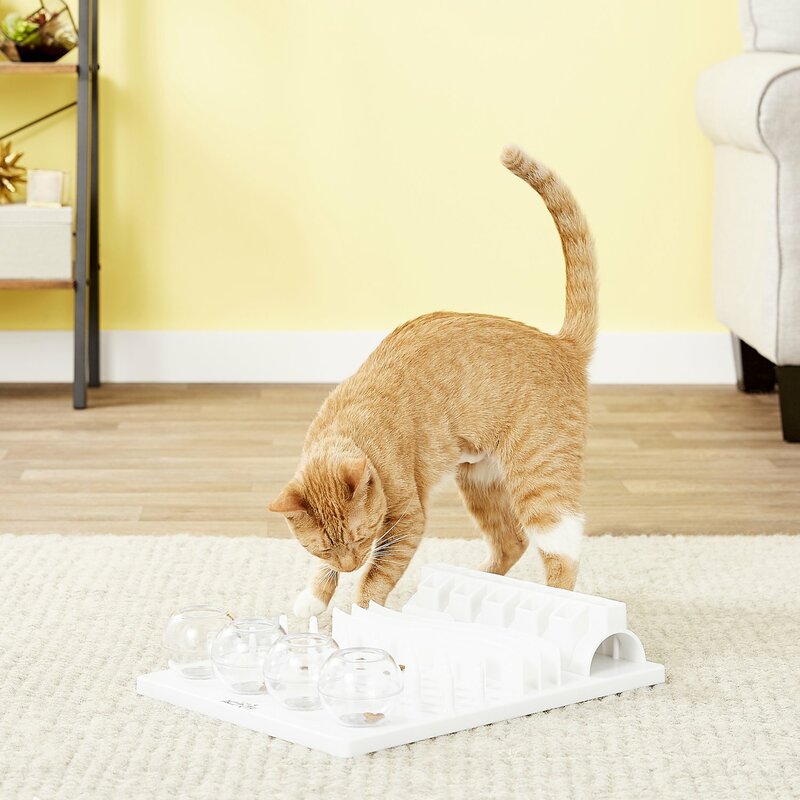 Still, many cat owners — including this one — remained skeptical about the benefits and added cost of puzzle feeders, so I wanted to give it a go for myself in my own home. 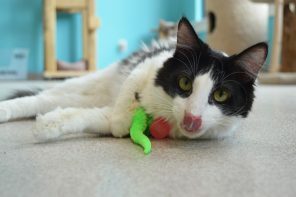 With seven cats, each with their own picky preferences, we have the purrfect test group for a variety of puzzle feeders. Our cats are used to getting three small snacks throughout the day and have dry food available to them 24/7. So the most work they ever have to do for their food is waking up a human to open a can. 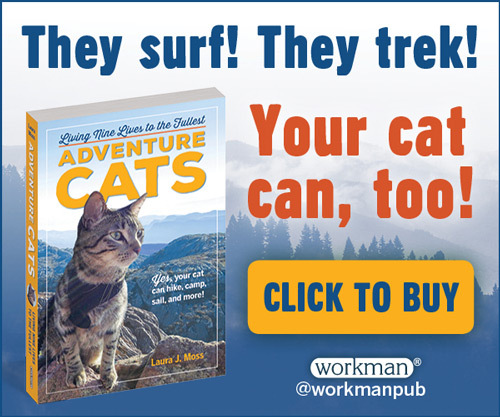 Although, I’m pretty sure my cats would open the can themselves if they had opposable thumbs. 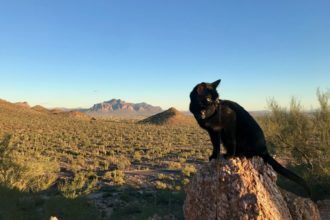 I took the suggestions of the JFMS article and tried a variety of puzzles and food types to see which my cats liked best, while also keeping their regular dry food available. I also talked to veterinarian and founder of Dezi & Roo Dr. Lynn Bahr to weigh in on the power of puzzle feeders. Her advice led me to try homemade contraptions in addition to store-bought ones. Sirius Black tests out the Catit Senses Food Tree. Bahr is an advocate of open feeding but says the best options tap into cats’ natural hunting instincts. She suggested two easy ways to create puzzles for cats that mimic hunting. Both can be accomplished with stuff you probably already have at home. For the first setup, you’ll need 10 paper plates and a couple handfuls of dry cat food. Place approximately 20 pieces of food (that’s about 40 calories worth of food or treats) on each plate and hide them throughout your home. Then let the cats discover their meals throughout the day. Her second suggestion follows something the JFMS study also advised: gradually increasing the challenge. For this puzzle, buy some small brown paper bags (think old school lunch sacks) and place a few treats inside one. At first, leave the bag open on the end so the cat can easily smell and find the treat. Next time you give kitty a treat, seal up the end with a loose twist and rip a hole in the bag. Once kitty has mastered that, make the holes smaller and smaller, until finally, the bag is twisted shut on the end and there’s no hole. That way, the cat has to do all the work. After your cat is used to finding their “prey” in the sealed bag, you can hide them around your home and let the cats go wild. Of course there are also pre-made options that you can fill with food or treats and leave out for kitty to find. The Kong Active Treat Ball is one of the more affordable options and it fits several sizes of kibble. It’s really up to you — and your cat — to determine which puzzle is best. 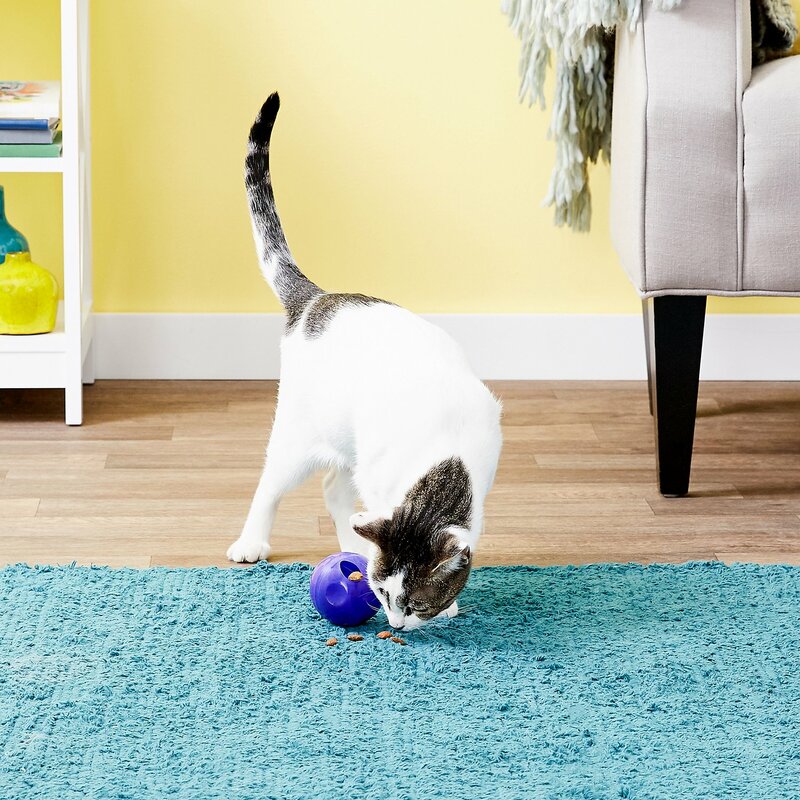 Kitty enjoys a snack from the KONG Active Treat Ball. But stimulation isn’t the only use for more complicated meal times. Both the JFMS study and Dr. Bahr agree that puzzle feeders can help with a pet that eats too quickly. In my home, we have a couple of particularly frisky eaters, who scarf down food so fast it often comes back up again, so I knew right away I wanted to try a feeder designed to slow them down. Because our cats have dry food available to them all the time, that’s part of their diet is usually not a problem. But when we break out the yummy-smelling, meat-filled wet food, they come running. And it’s almost a race to see who can eat the most. I have to say, for this particular problem, a puzzle feeder definitely works. We used the Hyper Pet Lickimat and our cats took to it right away. Plus it’s pretty affordable. 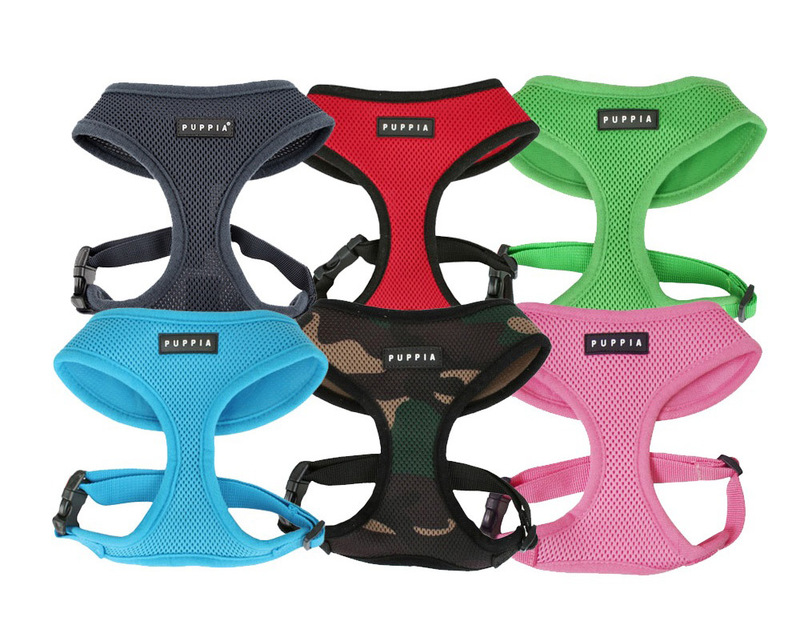 The Hyper Pet Lickimat is available in two designs. 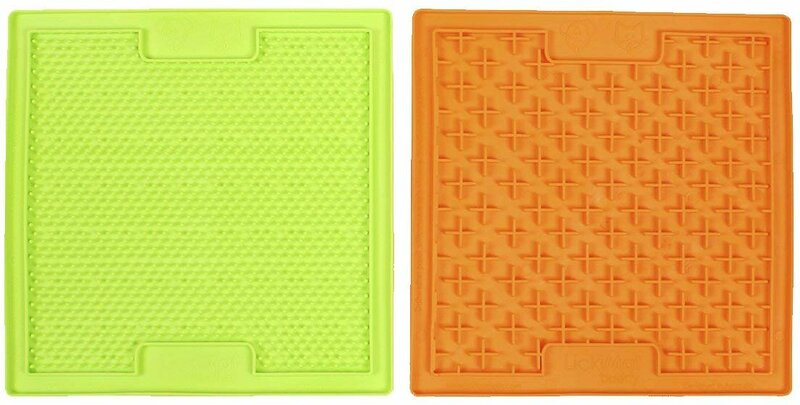 The Green Soother (with smaller grooves) works best with broth and bisque-like treats, while the Orange Buddy (with more space between the raised areas) works better for pâté or chunky style wet food. 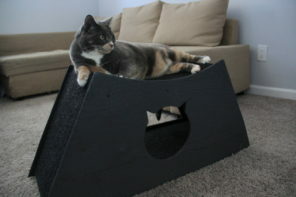 For dry food, another feeder that our cats enjoyed was the Trixie Activity Board. We primarily used it for treats, which is another area where our cats tend to overindulge. It both slowed them down and kept them engaged. 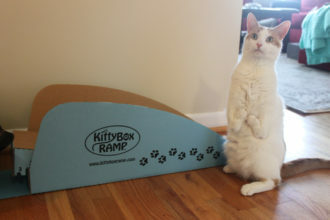 This tabby proves he will certainly work for his snacks on the Trixie Activity Fun Board. Before investing in a pre-fab feeder like the Trixie one, I would suggest first making your own puzzle feeder at home. The authors of the JFMS paper have a collection of DIY tutorials at foodpuzzlesforcats.com and they offer tips for introducing puzzle feeders as well. In my experience, the experts are correct: Eventually, any cat will use a puzzle feeder. 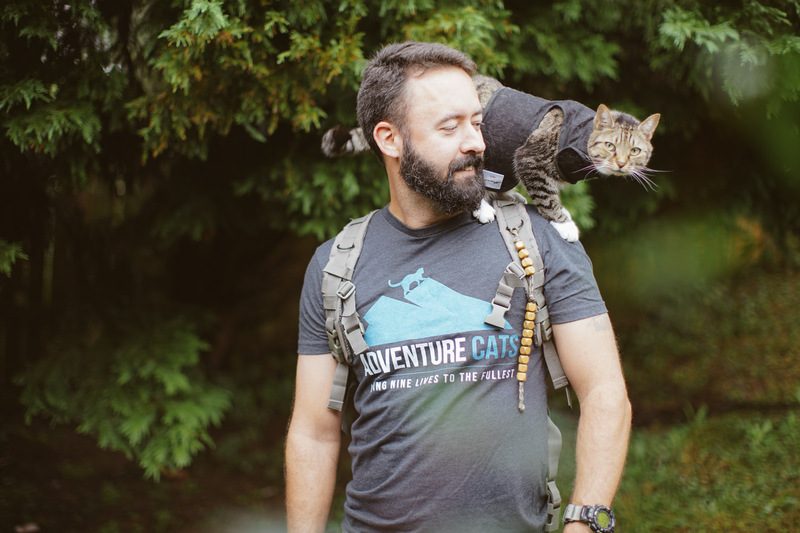 But just like food, toys and harnesses, cats will have a preference, so it may take some trial and error. Perhaps the best advice is to simply start small. 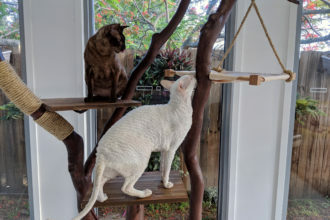 Dr. Bahr says even putting food up high, like on a cat tree or perch, can help a cat feel more secure or engaged during meal time and the extra little bit of activity may even help them lose weight. 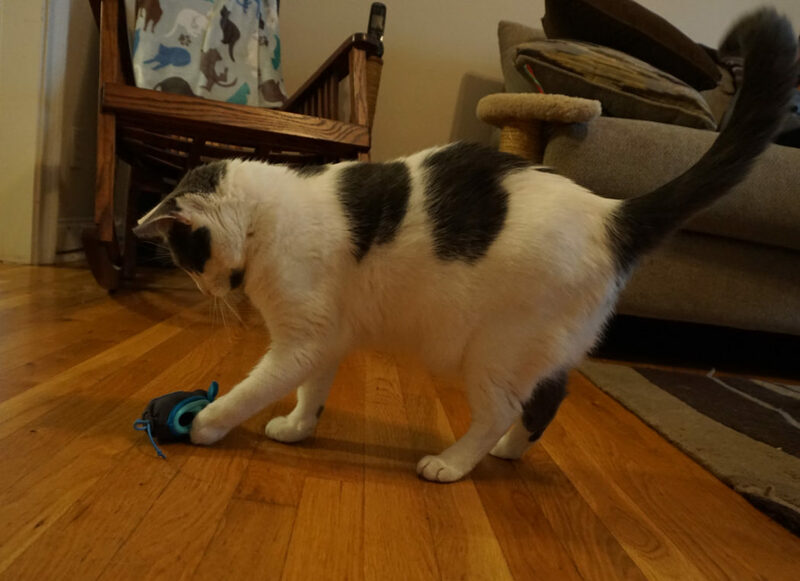 Bottom line: There’s no real way to simulate a hunt, so anything you can do to interact with your cat — from clicker training to hiding treats under the bed — will have similar benefits.